OC workers Jeff and Marilee Nelson use storytelling in Guatemala to help people understand God’s Word and share its message of salvation, even in the face of adversity. Jeff and Marilee work in Huehuetenango, Guatemala spreading the gospel through oral means, particularly “Simply the Story” (STS) inductive discovery Bible learning. The STS discovery Bible learning allows readers and non-readers to learn the Bible together, using questions to carefully observe and then apply the story as those in that day would have done. “The potential for the advance of the gospel is multiplied by enlisting the non-literate as God’s story tellers,” Jeff says. 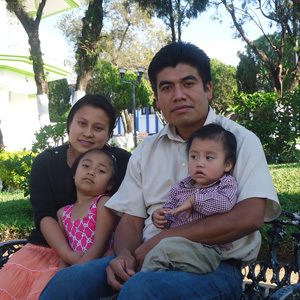 The Nelson’s also work with Guatemalans involved in missions, like their friends Adolfo and Elena Marroquin. 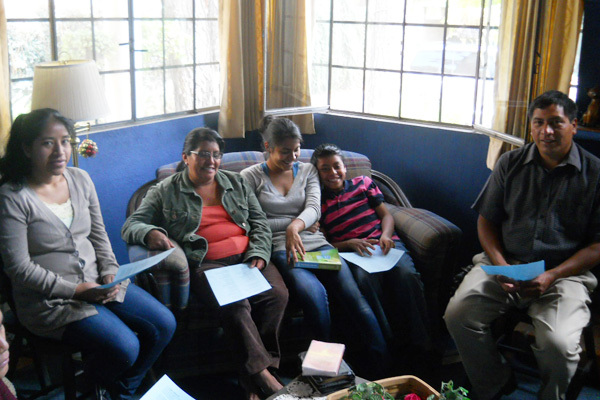 Adolfo is the director of a mission sending organization called AMIHUE, Mission Agency of Huehuetenango. AMIHUE missionaries Elizabeth and Victoriano were staying with Adolfo and Elena on the evening of the STS Bible study. The story was of Jesus coming to the temple in Jerusalem and the opposition he encountered from the Jewish leaders. Elizabeth was deeply moved as she made a personal connection and shared during the application time, she says she was touched by the retelling of the story and connected with Jesus’ response to the Jewish leaders: “In the community where we live and serve we are opposed, shunned and criticized. I see that the authority of God in Jesus can overcome opposition even though, in ourselves, we are weak and vulnerable.” She and her family work in a community that holds very tightly on to a traditional way of life. Elizabeth and Victoriano do outreach in the remote parts of Mexico, where they are seen as outsiders even though they are Mexican-born. Elizabeth and her family face challenges every day, but this time spent in the Word encouraged her that the authority of the Lord was that which would prevail. Pray for Elizabeth and their family and for a breakthrough with the people with whom God has called them to proclaim the gospel. Pray for Jeff and Marilee as they continue to spread the gospel in “non-traditional” ways. “Pray with us that the authority of God impact traditional religion, especially the tradition that the Bible can only be understood by those formally trained to interpret it. People possess ability to understand God’s story. It is for all to know, to consider, and by the grace of God to apply,” Jeff says. Would you like to give to support more outreach to communities in Guatemala? The Marroquin’s and others are family to Marilee and I as we serve the Lord together in our adopted country.